District 7 councilman Erskine Oglesby, Jr., said jobs "are there for the people to reach out and grab." The event was the mayor's Burger's With Berke Workforce Outreach. Where: The Bethlehem Center, 200 W. 38th St.
Mayor Andy Berke talks with Shenika Lewis about her hopes to further her education and get a job in the medical field so she can provide a better life for her son. The mayor was going door-to-door in Alton Park to alert residents that jobs are available in the Chattanooga workforce. 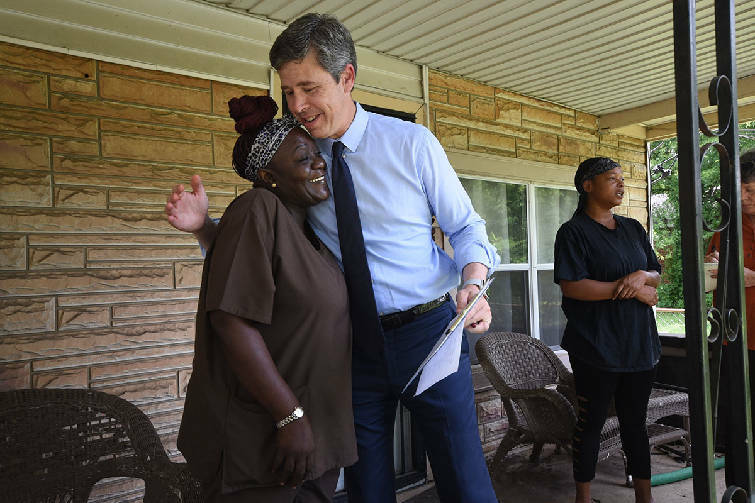 On the front porch with resident Cathy Whatley, right, Mayor Andy Berke receives a hug from Kelly Langston following a talk with both ladies about new employment opportunities in the Workforce Outreach Program. 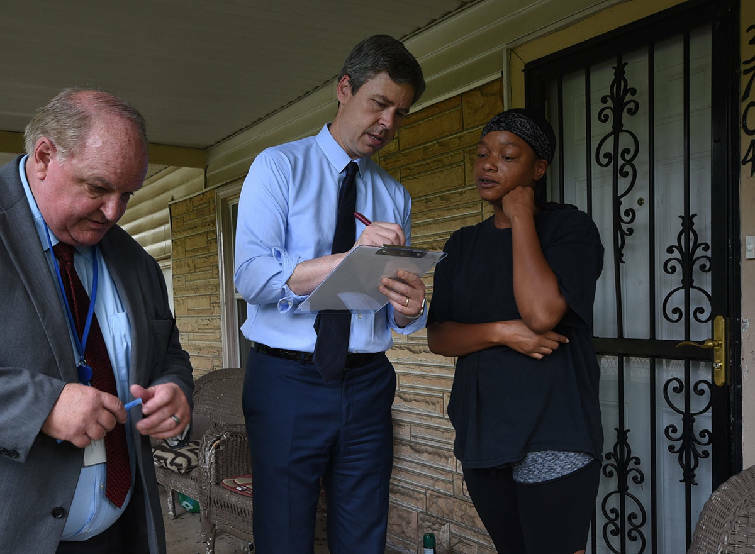 The mayor was going door-to-door in an Alton Park neighborhood to alert residents that jobs are available in the Chattanooga workforce. Mayor Andy Berke talks with Alton Park resident Cathy Whatley concerning jobs that are available in the Workforce Outreach program. Kent Burns, left, director of Workforce Development, walked along with the mayor on Monday. Shenika Lewis stood on the porch of her small green bungalow Monday afternoon, chatting with a man holding a clipboard who was asking about her work history. The man was Chattanooga Mayor Andy Berke, and the occasion was the launch of what he calls a "workforce outreach" program to help people who want to work or move up to better jobs. "The biggest thing in our community is if we can help people make more money," Berke said earlier at a kickoff event at which neighborhood residents, city workers and representatives of potential employers sat under a pavilion at Southside Community Park and munched burgers prepared by Chattanooga firefighters. Lewis, 33, told the mayor she graduated high school and used to work at the Waffle House on 23rd Street. "You were one of my customers one morning," she told him as her toddler son and grandmother peeped through the screen door. She'd like to go back to nursing school, she said. "I always wanted to be in the medical field. That's one job I see they're always hiring for." But she needs to work to provide for her 4-year-old son, she added. Maybe there's a way to do both, Berke said. He promised someone would be in touch to see if the new Office of Workforce Development can help. A few houses down, Cathy Whatley, 31, said she had some college credits and was "really, really prepared" to get back into the workforce if she could get more education. She has worked in warehousing, she said, but her dream job would be in accounting and office administration. "Our main thing is there's a lot of stuff happening people don't know about to get a job or a better job," Berke told her. "We want to find a way to help you get past those barriers." 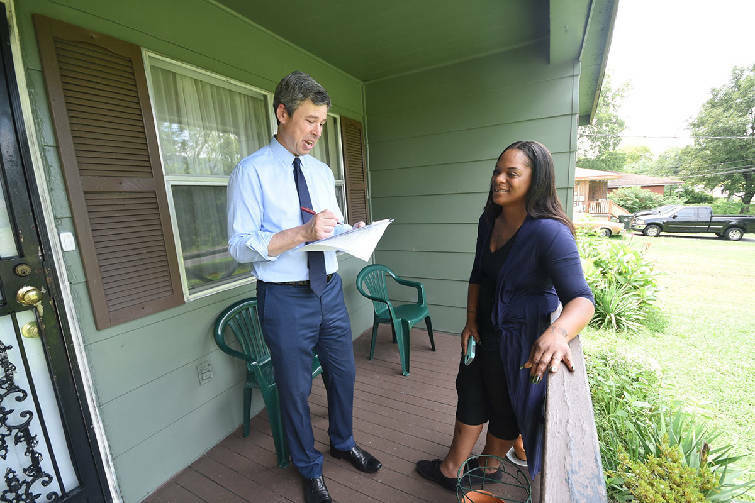 At the pavilion before the door-to-door canvass, Berke said that even with unemployment at a record low, too many people are stuck in low-end, low-paying jobs. The city's new Office of Workforce Development will work with community partners to help assess skills and match people to jobs, he said. The Chamber of Commerce, the IBEW and the Ironworkers were among the partners at Monday's event. Others include the Urban League, Chattanooga State, the University of Tennessee at Chattanooga and more. Workforce development director Kent Burns said the new office will offer several kinds of programs, from skills training to helping ex-offenders re-enter the workforce, but the first priority is this community outreach. Burns said 50,000 households in high-unemployment parts of Chattanooga will get mailers asking people to let the city know what they need to get a job or move up. The office also has hired navigators to knock on doors, do assessments of residents' education, skills and interests, and try to match them with employers. City Councilman Erskine Oglesby Jr., who attended the lunch along with Councilwoman Demetrus Coonrod and state Rep. JoAnne Favors, said this program is the flowering of a campaign promise for him and he's going to "stay on them" at the workforce development office to make sure it gets sound footing. "We have to make sure every person in our community can take advantage of this," Oglesby said. Better jobs are "there for the people to reach out and grab."